As far as I can remember, this is the first episode of Mork & Mindy I've ever seen. It was a fairly significant show in that it was Robin Williams's first major role. For better or worse, the series also paved the way for shows like Alf, 3rd Rock from the Sun, and even things like Invader Zim. If you've never seen Mork & Mindy, the series is a bizarre spin-off of a character who appeared in what was originally a dream episode of Happy Days. Mork is an alien who's come to Earth to observe humanity, and the vast majority of jokes concern his odd behavior and misunderstandings of our nature and customs. I'm going to go out on a limb and say the Christmas episode was probably fairly representative of the first season of the show (my understanding is that it transformed pretty dramatically from season to season in an attempt to hold ratings). The episode opens with Mork initially mistaking Christmas for some sort of contagion. They run with this joke for a minute or two before Mindy corrects him. 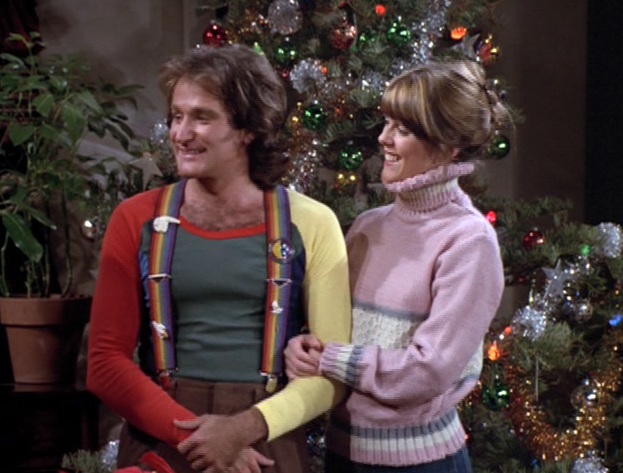 The rest of the episode revolves around them celebrating Christmas together, along with Mindy's parents and her old friend, Susan, who's no better with people than Mork. Characters in this show tend to gravitate to extremes: either they're vapid straight-men or extreme characterizations. Both types are fundamentally one-dimensional, making it difficult to care about anyone. What drama exists is due to the other main plot-line, which concerns Mork's attempts to make gifts for his friends. He puts in the effort, but doesn't bother taking the time to learn that people won't like things made from old chewing gum or dead flies - like I said, subtlety is not this thing's strong point. Mork sets out to try and fit in, but of course does so in the most inexplicable ways possible. The joke, obviously, is that he gets everything wrong, because he doesn't understand the human mind. Is it worth noting that he doesn't really seem to be trying, though? Or that the human characters don't really go out of the way to help him? Three of the four characters in the episode seem to know what he is, but they only give him vague outlines of the holiday, ripe for misinterpretation. Sure, that's the point. But it's also extremely lazy writing. To its credit, the resolution clears up the mess a bit. Mork overhears that the others expressing annoyance at his gifts. This leaves him uncharacteristically downcast. But when he hears that it's the thought that counts, he uses his alien powers to unlock a joyful memory from each of their pasts. It's a brief foray into something reminiscent of magical realism in a show that, up to that point, had been wacky slapstick. While it certainly doesn't redeem the episode, it's a surprisingly poignant moment. Until the finale, the only interesting thing is Williams, whose spastic ad-libbing is impressive, even if most of the humor didn't age well. For every eight or nine jokes he tosses out, I'd say one still finds its mark. Fortunately, he fires them off with enough frequency to make up some of the difference in volume. Overall, it's not awful, but it isn't something worth watching unless you're especially interested in the history of comedy SF or the career of the late Robin Williams.